Spreading center volcanism occurs at the site of mid-oceanic ridges, where two plates diverge from one another. As the plates are pulled apart, hot asthenosphere rises upward to fill voids of the extended lithosphere. The rise of this hot mantle provides thermal buoyancy to the ridge area and this is the reason that they stand as high ridges in the center of ocean basins. This is demonstrated in the colored relief images shown here. As the hot asthenosphere rises to shallow levels, it decompresses and melts to produce basalt magmas. These magmas pond in crustal magma chambers where they are periodically tapped by vertical fractures that provide conduits for the rapid rise of magma to the surface. The eruptions produced in this manner are typically fissure eruptions. The erupting basalt can generate vast submarine lava fields. Typically, the lava quenches quickly against the bottom waters to produce characteristic bulbous shapes called pillow basalt. 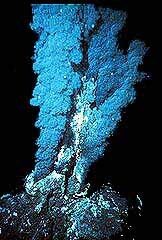 The high heat content of mid-ocean ridges is evident from the occurrence of numerous hydrothermal vents. These form from surface water that seeps downward through cracks where it heated by hot rocks lying above the magma chambers. These hot thermal waters then ascend back through the overlying crust, where they leach out silica and numerous metals from the basaltic lava. The hot springs created at the surface are called a black smokers because they are readily identified by billowing dark clouds composed of metal-rich fluids. Above: pillow basalt from the south Pacific. As basaltic lava erupts at the surface, more or less continuously for millions of years, it is constantly accreted onto the edge of the spreading plates as it cools into a hardened basalt layer. This process generates oceanic crust. Oceanic crust is youngest near the ridge, but it becomes progressively older away from the spreading center due to divergence of the plates over time. This age progression is demonstrated in the image below. 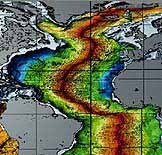 Age of the Atlantic oceanic crust. 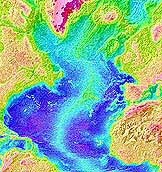 The crust near the continental margins (blue) is about 200 million years old. It gets progressively younger toward the mid-Atlantic ridge, where oceanic crust is forming today. Courtesy of NOAA.